Augustus Kollner (1812-1906) was born in Wurttemberg, Germany but he is most famous for the work he produced in the United States. Kollner began his successful artist career at a very early age; publishing in Germany and in Paris before he moved to Washington, D.C. in the 1830"s. His first jobs in the U.S. involved the production of trade cards and banks notes for Baltimore and Washington commercial concerns. During this time, he traveled extensively, sketching his observations of Virginia, Maryland, Maine, Ohio, Pennsylvania, New York, New Jersey and Canadian landscapes. Many of the resulting works were later incorporated into this remarkable series of views that Goupil published in New York and Paris in 1848. 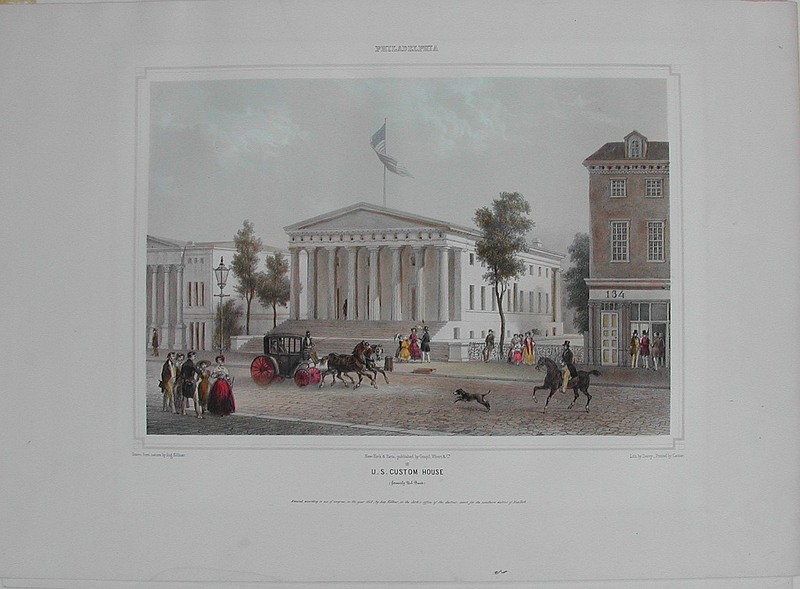 Views of American Cities contained 54 lithographed scenes, including 7 views of Philadelphia. The prints provide wonderfully artistically rendered depictions of everyday life and great topographic detail. 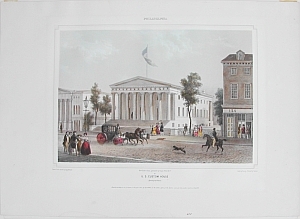 This lively view depicts Chestnut Street facade of the grand marble-faced building designed by William Strickland to serve as The Second Bank of the United States. It was built between 1821 and 124. Between 1845 and 1935 it served as the United states Custom House. Approximately 13 x 15 inches, sheet.